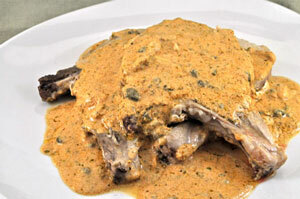 Thyme for Cooking Dinner tonight: Pork Chops with Ginger Caper Sauce. 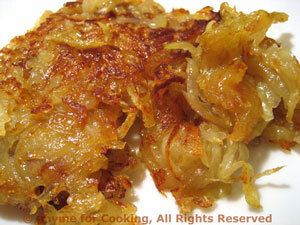 We love hash browns - they're easy and a favorite. Fry the chops, then kept warm while the sauce is quickly made. Remember, slightly pink pork is okay, and keeps it tender and moist. You need Greek yogurt, crème fraiche or sour cream for this. Regular yogurt will not give a nice, thick sauce. The only trick to making great hashbrown potatoes is patience. Pat them in the skillet and let them fry! Shred the potatoes using the large wholes on a box grater or use a food processor. Heat butter and oil in a medium nonstick skillet over medium-high heat. Add potatoes and flatten as best you can with a spatula, reduce heat to medium and let fry. After 10 minutes lift up an edge to see how it looks. Keep checking until it's a nice, golden brown. Using a large spatula, lift and turn the potatoes in large sections, breaking and spreading as needed, to brown the other side, another 7 - 10 minutes. 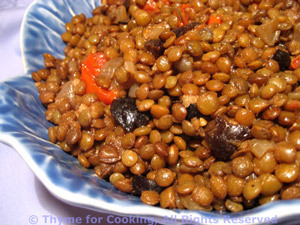 When done to your liking, remove, add salt & pepper if desired, and serve.